Saber is a knight. Her pristine armor and sword embody her strength. Her clear eyes tell tales of her unbroken will. Her form sweeps through countless battlefields, light as the wind, powerful like a storm. Saber is a knight. The bloodstained steel encasing her body seems heavy enough to crush her delicate frame. The ice within her gaze is a wall meant to stop the flames of regret. Her battle knows no end, no respite, and no hope. Saber is a hero. For a lifetime, she surrendered herself to the burden of the fate and expectations of a nation. She has long sacrificed everything she ever had, and yet the burden of duty torments her forever. 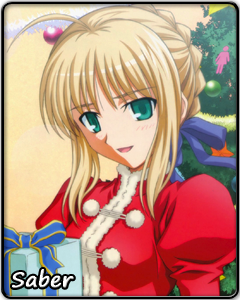 Saber is a girl. She keeps moving forward, waiting for her own life to begin. She keeps hoping and waiting for salvation.